Celebrate the coming of autumn with this adorable paper plate scarecrow. It’s easy to put together and uses a minimal amount of supplies. Cut 2/3 of the plate rim off, leaving 1/3 for the collar and straw. Set the 2/3 piece aside for a later step. Paint the round center of the plate with the pale yellow color. Paint the rest of the plate with goldenrod. Cut the pieces needed from the patterns. 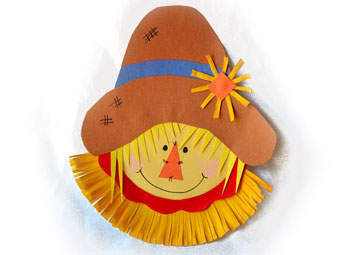 Use brown construction paper for the hat, blue for the hat band, yellow for the hair, and orange for the nose. Take the piece of plate that you cut off in step 1 and make a scallop cut (wavy curves) to create the collar around the scarecrow’s neck. Paint this piece red. Paint half of the remaining piece of plate with goldenrod paint. Cut into thin strips to use for the flower on the hat. Take the plate with the round center and cut the goldenrod section into fringed strips to create the neckline straw. Glue the red scalloped collar on above the neckline straw and below the round center of the plate. Glue the blue band to the hat and glue the brim on afterwards. Glue the goldenrod strips on one at a time, forming a flower shape on the right side of the hat band. Cut a small square from orange construction paper and glue to the center of the flower. Glue on the triangle nose and draw on eyes and a mouth. Dab a light amount of pink paint on for cheeks. Position hair where you want it, place hat on top of the hair. Reposition until you have it where you want it, then glue in place. Draw stitches on hat and nose if desired. Add 3 dimensional features to this craft by using yarn for hair and a pom pom for the center of the flower. Add a magnet to the back to hang on the refrigerator. Tape a piece of ribbon or string to the back to make a hanger. Hang on your bedroom door to welcome fall!